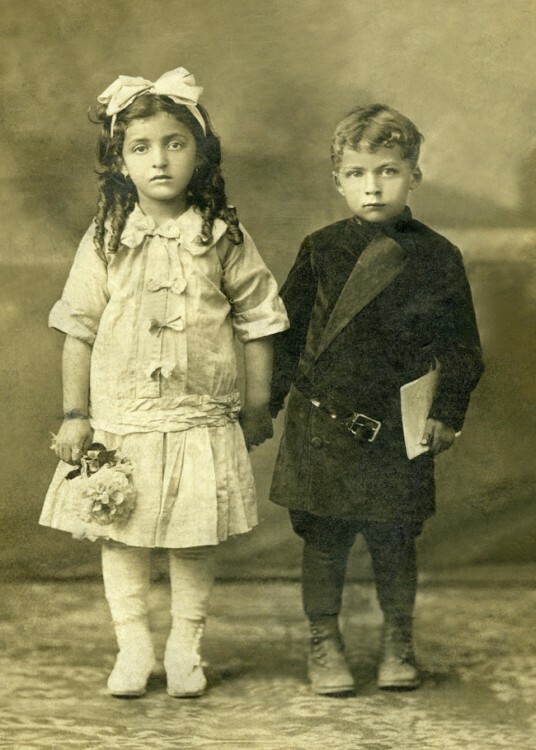 Tussie-mussie collector Irene Deitsch's father, Benjamin Levin, and her aunt Clara, who is clutching a posy holder in her 7-year-old hand. This family photo is from 1912, the tail end of the tussie-mussie era. 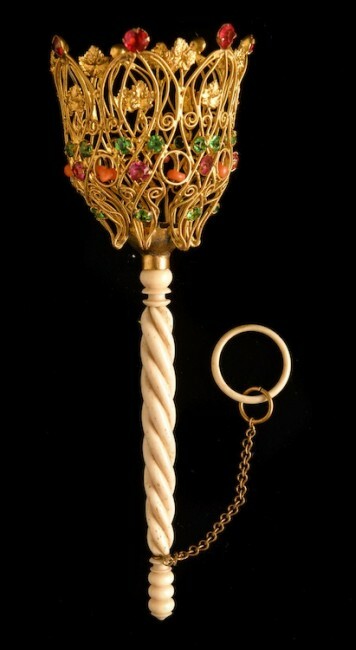 This English posy holder, circa 1870, boasts coral beads, a gilt wire basket, and a double-twisted ivory handle. The finger ring is also ivory. An English posy holder, circa 1870, with red garnets and pewter angels. 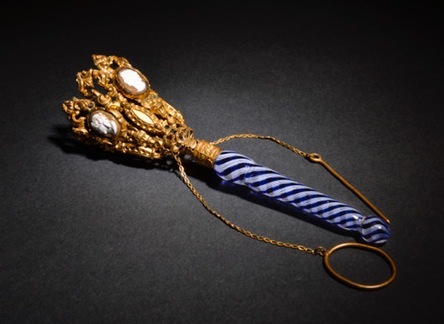 This rare Chinese posy holder and finger ring, circa 1890, is made of 24-karat gold. 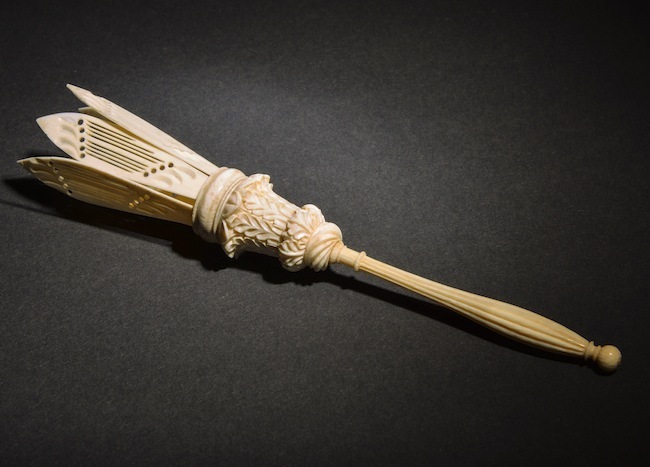 An English posy holder, circa 1840, made of carved ivory. 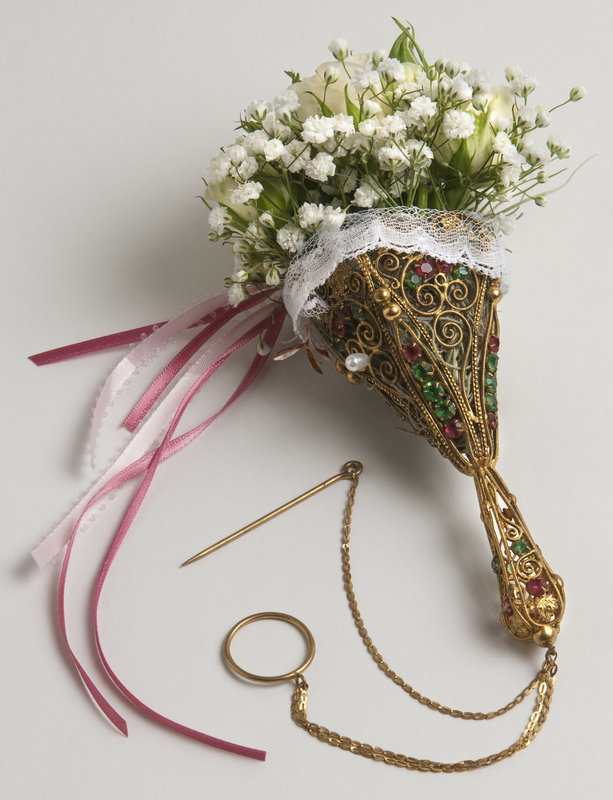 It is not common to find a posy holder in its original presentation case. 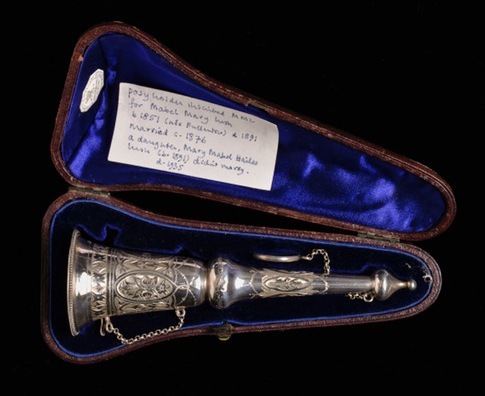 This one is Australian, circa 1876, and came with a provenance of its ownership. 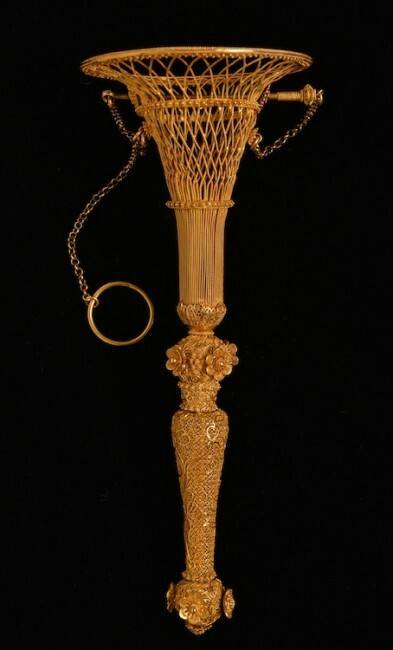 A French tussie-mussie, circa 1860, featuring cameos around the basket and a glass handle made in the renowned French glass center of Clichy. 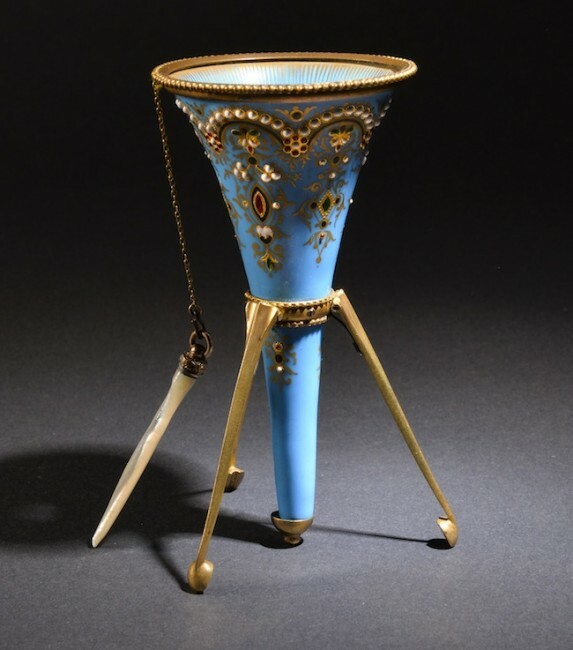 An intricately enameled, 14-karat gold tussie-mussie, in its original satin-lined leather container. From Liverpool, England, circa 1880. Many tussie-mussies had spring-loaded handles that opened to create tripods, so that a lady could set the holder down when dining. 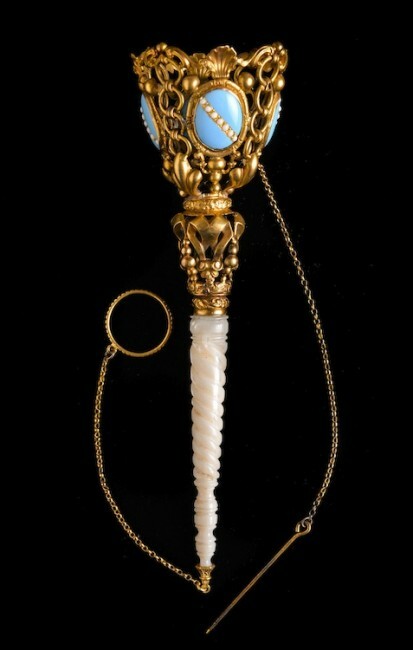 This English example, circa 1870, is heavily enameled and gilded, and features a mother-of-pearl pin. 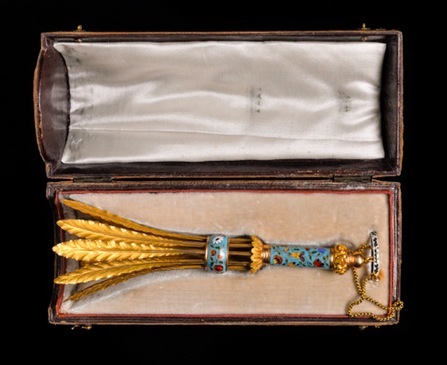 A pierced-gilt posy holder, with turquoise enameled medallions and a mother-of-pearl handle. Probably French, circa 1870. 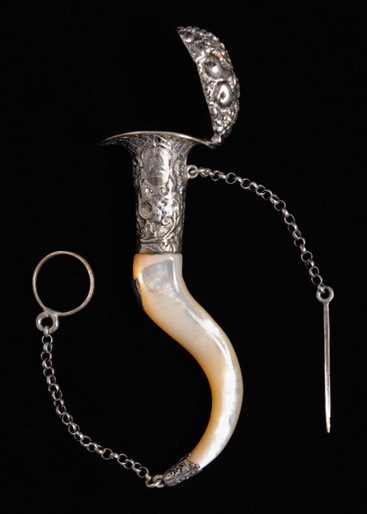 This silverplate tussie-mussie, circa 1870, is probably German and features a mother-of-pearl handle. 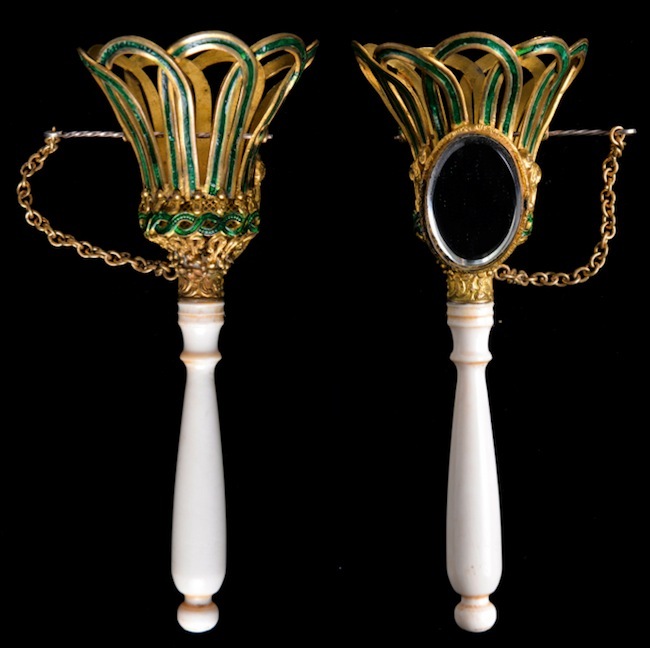 An English tussie-mussie, circa 1889, with green enamel on gilt and a flirting mirror. An English tussie-mussie, circa 1880, with an Italian cameo on the front and an ivory dance card on the back. 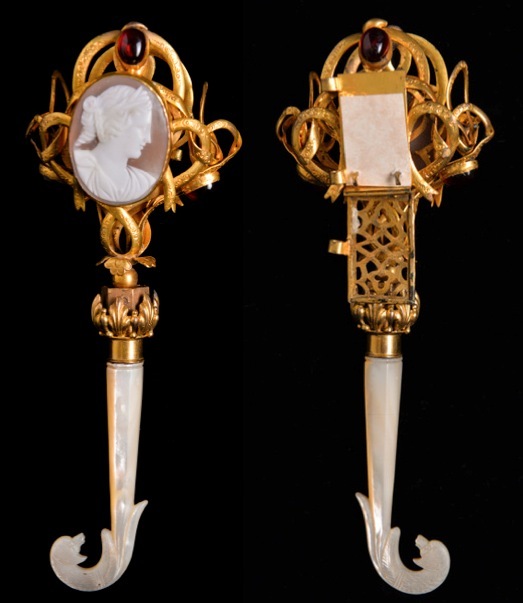 The handle is mother-of-pearl. 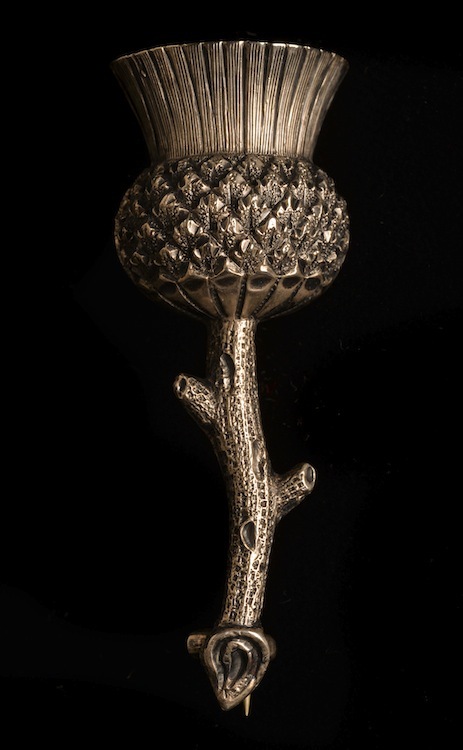 A Scottish posy holder, circa 1880, made of sterling silver and shaped like a thistle, the national flower. 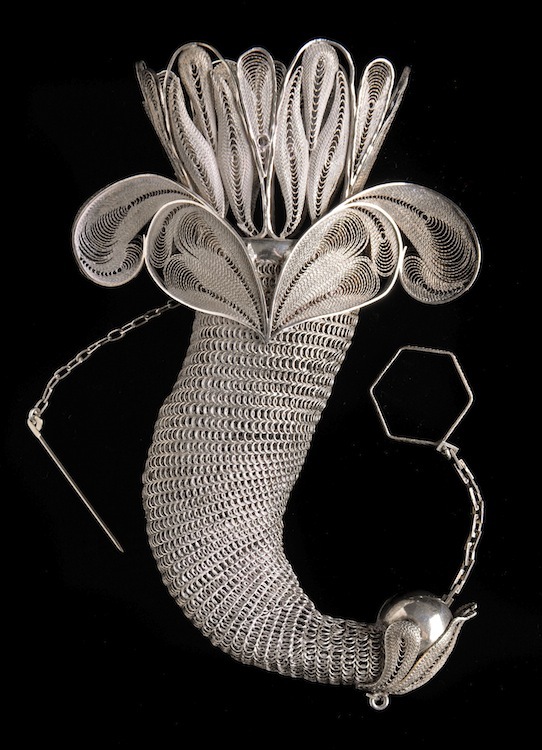 A sterling silver, wire mesh tussie-mussie from France, circa 1870. In the fall of 2016, the greatest offense to the olfactory organs of most Americans is undoubtedly the cesspool stench emanating from the current presidential election. But a few hundred years ago, the actual smell of civilization was so bad that some people carried offsetting aromas with them in devices such as pomanders and vinaigrettes. By the 18th century, a new category of decorative deodorizers arrived in the form of small vases called tussie-mussies, which could be pinned to one’s clothing or held in the hand, so that one’s nostrils were never far from a fragrant bouquet of sweet-smelling posies. 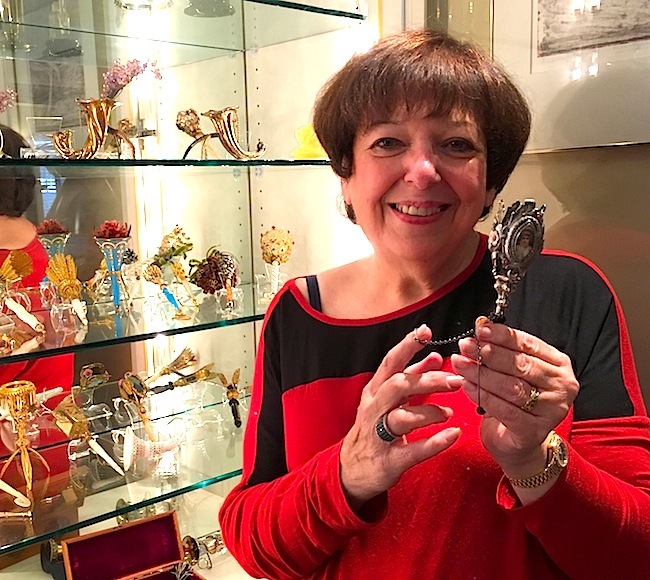 Irene got her first whiff of the world of tussie-mussies while on vacation in Washington, D.C., with her husband, Marshall, who collects glass paperweights. “We went to the Smithsonian,” she recalls, “and there must’ve been five or six display panels filled with these things. I was entranced.” A few days later, while in Charleston, South Carolina, visiting friends, she bought her first tussie-mussie, a cornucopia shape, in a local silver shop. Deitsch no longer has that first purchase, but over the years, her collection eventually grew to 250 or so pieces, mostly from Europe and Russia. Today, she has around 130 examples, the best of which reside in illuminated cases in the couple’s living room. Collector Irene Deitsch, with just a few of her tussie-mussies. 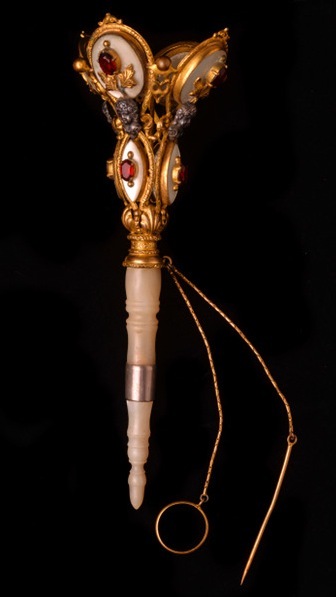 In her book, Deitsch organizes her tussie-mussies by their materials—sterling silver, silverplate, gold, ivory, glass, porcelain, mother-of-pearl, straw—as well as their styles—handheld vs. lapel pin, bosom bottle vs. three-legged tripod. While some of these objects may be admired for their beautiful enameling or intricate etching, many are also windows into the courtship customs of privileged young ladies during the Victorian Era, particularly in England. “Some have flirting mirrors on them,” Deitsch says, “so a young woman carrying a tussie-mussie could see who was behind her.” Others sport small flat surfaces holding thin sheets of ivory, upon which the names of gentlemen desiring a dance would be written. In fact, even though combating the odors of society may have been the original motivation for creating tussie-mussies, the pieces quickly became high-society fashion accessories and vehicles for what was known as the language of flowers, which was one of Queen Victoria’s favorite preoccupations. “Proper ladies didn’t have a lot to do in those days,” Deitsch sighs, “so they would garden, get together, and talk about florigraphy—a red rose signified passion, a pink rose stood for a new love, a yellow rose was a sign of jealousy, a white rose a mark of purity, and so forth.” Wearing such well-understood expressions of one’s frame of mind or romantic availability was critical at dinners and balls, since talking about such things in public was simply not done. In the end, though, despite their beauty and capacity for encoded messaging, tussie-mussies were about delivering fragrant aromas, which were often deliberately strong. “During the Victorian Era,” Deitsch says, “women were expected to wear tight corsets. Sometimes the ballrooms were so hot and the corsets were so tight that a woman would faint, so some tussie-mussies had vinaigrettes on them filled with smelling salts.” No doubt there are a lot of American voters who could use a good snort of smelling salts right about now. this is a great article!!! my Buddy Steve Yvaska forwarded it to me….i was lucky enuf to meet Irene when she & her hubby were guests at one of Steve Y’s Antiques classes…..learned a lot from her & never knew “T-M’s” existed. Very interesting article about Tussie Mussies, could have done without the political references though. My goodness, can’t we even search the internet for vintage beauties without getting a dose of ugly politics.